The European Central Bank and its member national central banks are on track to make between €10 billion and €22 billion of profit out of lending to Greece, if Greece pays its debts in full, according to new analysis of official figures by Jubilee Debt Campaign. Greece is due to make a €4.2 billion payment to the ECB on 20 July and a further €3.2 billion on 20 August. The ECB and its national member central banks are already holding onto €1.9 billion of profit made from Greece’s debt repayments in 2014, which they had promised to return, but never have. 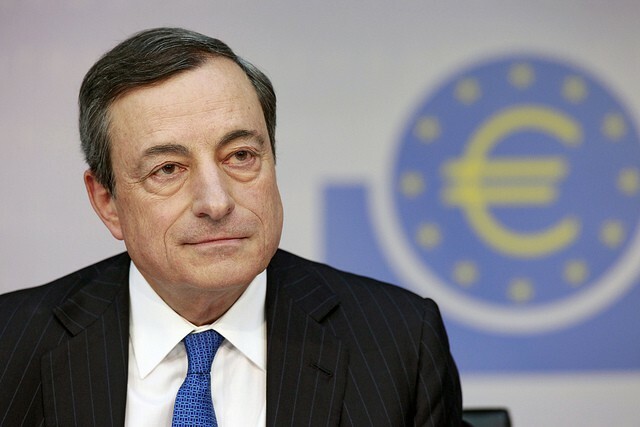 All profit made by the ECB and its members – the central banks of Eurozone countries – is ultimately passed on to their respective governments. The ECB estimates that the total profit will be €5.6 billion between 2014 and 2016. Using this we estimate that the total profit into the 2020s will rise to €10.4 billion. However, analysis of official figures suggests that the ECB’s stated profits are an underestimate. Based on the difference between the average effective interest rate the ECB has received on what it paid for the debt of 10%, the maturity of the debt, and the normal negligible cost of borrowing from the ECB, we estimate the true profit could be up to €22 billion. The ECB and its member national central banks are making profit out of Greek debt because they bought it when it was trading well below face value in 2010, refused to take part in the agreed debt restructuring in 2012, and so are receiving far more in repayments than they spent on the debt. The ECB and its national member central banks have refused to return the profit they state they made in 2014 to Greece, demanding more austerity conditions be implemented before they do so. The funds are therefore effectively being used as a tool to pressure the Greek government to sign-up to more austerity conditions. In May and June 2010, the European Central Bank, on behalf of Eurozone central banks, created money with which it bought Greek government debt, under the Securities Markets Programme (SMP). At the time, Greek government debt was trading more cheaply than its face value, because of the risk that the debts would not be able to be repaid. In 2012, the bonds that were still to be repaid were restructured (the so-called Private Sector Involvement), but all the ECB debts were explicitly excluded from this restructuring. This means that when payments are made to the European Central Bank on these debts it makes a large profit, as it did not have to pay the full face value of the debt. It also makes an additional profit out of the interest the Greek government pays on the debt. In total, the European Central Bank and national central banks bought €56.2 billion of Greek debt, according to analysis by a University of Munich academic. Of this, €29 billion has been repaid, with €27 billion still outstanding. In December 2012 the Eurogroup agreed that the profits made by the ECB and national central banks would be returned to the Greek government. However, this is voluntary. They have failed to return €1.9 billion of profit made in 2014. The ECB estimates that the profit in 2015, if the debt is paid in full, will be €2 billion and in 2016 €1.7 billion (€5.6 billion in total). The ECB did return €2 billion of profit from 2013 to Greece. The ECB has bought bonds to be repaid up until 2028. If these continue to be paid in full, the ECB and member national central banks will continue to make exceptional profits. Based on the rate at which the ECB has been making profits and the maturity of the remaining debts to be paid to it, we estimate they will make a further €4.8 billion profit out of Greece between 2017 and 2028. This would be €10.4 billion of profit in total. The cost of borrowing from the ECB is 0.05%. Using the difference between the 10% yield, and the ECB’s cost of borrowing, put alongside the maturity of Greece’s debt, suggests that the ECB made €12 billion profit between 2012 and 2014, and would make €24 billion in total by 2028 if the debts and interest are all paid in full. Taking away the €2 billion which was returned in 2013, this is €22 billion of profit in total. One estimate is that the Eurosystem banks (the ECB and national central banks) collectively made €6 billion profit out of Greek bonds in 2013 alone. Various information sources on the debts owed by Greece to the ‘Eurosystem’ are unclear on exactly which bonds were bought by the ECB and which by the national central banks which make up the ECB. Both the ECB and national central banks bought Greek debt in May and June 2010, but the national central banks only with the agreement and guidance of the ECB. The ECB’s profit is apportioned to its national central banks in proportion to their holdings in the ECB, who then pass it on to their respective national governments. Therefore, whilst we are unable to divide up exactly how the debt and profit has been apportioned between the ECB and national central banks, whatever the amounts, all the bond purchases were decided by the ECB, and all the profit ultimately accrues to national central banks.